So I decided to ditch work (the perks of being self-employed) and head out to Mitsuwa in Costa Mesa for opening day of the Umaimono Gourmet Fair. I arrived sharply at 11:30 and circled the parking lot for the next 20 minutes like a killer くじら (whale). I finally managed to squeeze into the smallest spot in compact row (you know...the row behind Ango Tei) and as luck would have it, I noticed another car's paint scratched across my bumper when I got back (it was actually my bro's car that I ended up selling later this afternoon so no worries). Anyway, I can't imagine what the parking will be like this weekend so you should probably go early or meet up with friend's at a different location and go in one car. 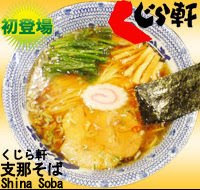 Shinasoba Ramen: Okay, so it's not as good as Shinasobaya, but it still felt refreshing to taste this Shinasoba from Kanagawa. Somewhat oily and extremely hot, this assari ramen, although delicious, was very difficult to describe. I'm not sure if I really liked it, but I know I didn't hate it. The noodles were slightly overcooked, but that could have been due to the time it took for me to get my camera working (I'll let it slide). The toppings (a roast beef like chashu, menma, negi, naruto, and nori) were delightfully different. Overall, I think it could have used more flavor. I may have to go back and try it again this weekend. The thin noodles could have been firmer, but like I said above it was probably my own fault. I must go back again this weekend. Plus, that beef tongue looked really good. I'll have to try it. It looked like the takoyaki from Takoya Kukuru was the most popular item from the fair. That line was at least 25 people long. For more info on the rest of the Costa Mesa vendors you can read a detailed review of fellow blogger ExileKiss here. Hachiya Instant Ramen - Reunited At Last!